While Menlo Park resident Paul Bendix maintains a blog, the idea of putting his story into book form initially seemed daunting. But, a chance meeting with author Erik Larsen, author of A Nation Gone Blind, propelled him forward, much like the wheelchair he’s used since being mugged and shot in the spinal cord at age 21. 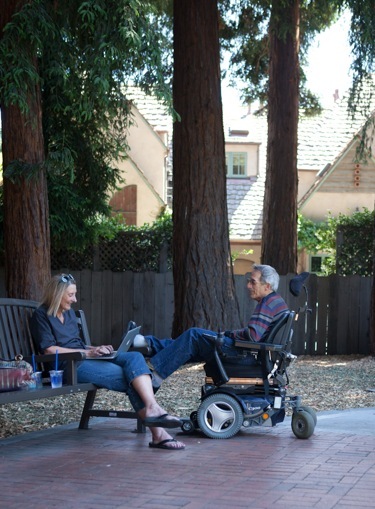 Paul has long chronicled the emotional, social, and practical challenges of living with disability. But, anyone thinking his book Dance Without Steps: A Memoir is a downer is mistaken. Paul’s considerable wit is as evident in print as it is in person. Paul will discuss Dance Without Steps on Saturday, June 16 at 11:00 am in the Menlo Park City Council Chambers, 701 Laurel Street. The free event is supported by the Friends of the Menlo Park Library. Copies of the book will be available for purchase and signing after the talk. Free wheelchair accessible van service is available for Menlo Park area seniors and people with disabilities; call 330-2512 for van reservations.